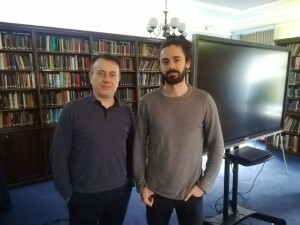 This 2nd progress meeting of the EU innovation project X5gon (2017–2020) was hosted by project coordinator University College London (UCL) at Cumberland Lodge in Windsor, UK. All other project partners where represented in the meeting: Institut Jožef Stefan (IJS, Slovenia), the Knowledge 4 All Foundation (K4A, UK), Universitat Politècnica de València (UPV, Spain), Université de Nantes (France), Universität Osnabrück (UOS, Germany), the Post of Slovenia (PS) and the Ministry of Education of Slovenia (MIZS). UPV was represented by MLLP members Alfons Juan and Álex Pérez. The X5gon proposal stands for innovative technology elements converging currently scattered Open Educational Resources (OER) available in various modalities across Europe and the globe. X5gon combines content understanding, user modelling and quality assurance methods and tools to boost a homogeneous network of (OER) sites and provides users (teachers, learners) with a common learning experience. X5gon deploys open technologies for recommendation, learning analytics and learning personalization services that work across various OER sites, independent of languages, modalities, scientific domains, and socio-cultural contexts. 9 months into this 3-year project, the focus of the meeting has been putting together the progress by the X5gon partners so far. The project’s milestones are being achieved satisfactorily, which will be reflected in this year’s planned project deliverables and in the project’s first review meeting with the EC in Autumn this year. The UPV reported a steady progress in their main tasks, which include the development and application of language technologies (speech recognition and machine translation based on deep learning) and the piloting of project components on the initial X5gon OER repositories: UOS’s virtUOS, UPV’s Mèdia UPV and JSI’s VideoLectures.NET. The UPV has been devoting a special effort to improving accuracy in speech recognition and machine translation for the main languages in these repositories: English, Spanish, German and Slovenian. MLLP members Alfons Juan and Álex Pérez represented UPV at the 2nd X5gon progress meeting. Included in the agenda was also a Workshop on AI challenges in online education. Experts in this area, including TJ Bliss from Wiki Education and Pierre Dillenbourg from EPFL, were invited to share their experiences and discuss research, technology and policy challenges. The workshop has been an opportunity for the cross-fertilization of approaches, techniques and ideas from the many fields that comprise AI in education. We at the MLLP research group are looking forward to continuing collaborating with our partners in the X5gon project. Update: You can read more about this project meeting at the X5gon website here: 2nd X5gon project meeting. Posted in All, Events, Projects and tagged Educational Technologies, MLLP project, OER, Open Education, X5gon project meeting.